I'm afraid I've missed a couple of Tisha's Looking at the Sky on Friday memes lately but have more than enough pictures to make up for it and post in the weeks to come thanks to my recent trip West. As a matter of fact, while driving around in the Sierra Nevadas this past Wednesday, just about every photo I took was one that I thought would be perfect for this meme! 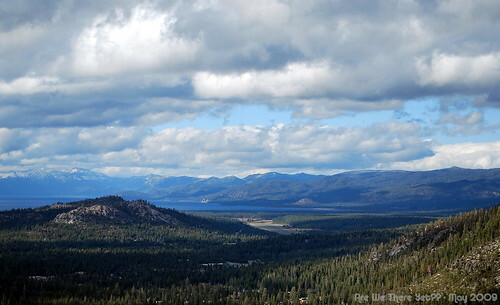 This is the view from the top of Highway 50 in California as you come around the bend and catch a glimpse of beautiful Lake Tahoe. This view never fails to take my breath away and even though there were plenty of clouds around, I still thought it was one of the most gorgeous places ever. That might be pretty easy to see why! For more beautiful sky pictures be sure to swing by Tisha's blog and may everyone have a great Friday no matter where you may be! Stunning view, Linda! The layers of color and textures in this is amazing! Wow that is gorgeous! Great capture. I'd love to be there right now. Every Friday is great, Linda! Terrific as always! Welcome back!! I really need to get down south to see the daughter and Carol which will mean a trip to Tahoe. You are right, it is one of the most beautiful places there is in the world. Wow - that's quite a view! No wonder you wanted to make lots of stops along Highway 50. The proportions of foreground, mountains, and sky is just perfect in this pic. Hope you enjoy the rest of your Friday! I love when the clouds meet the earth! what a great shot!! I remember that view quite fondly! have you reverted to eastern time yet? It's hard to choose what's more beautiful, the sky or the landscape. Both are breathtaking! After we were married, we came from Reno, to Tahoe. I absolutely adore this part of the state! This is such a fabulous picture, Linda...but you know I'm biased! Absolutely LOVE this photo...and this place:-) Fond memories for us in that area for sure.